Wired Equivalent Privacy (WEP) is either a 64-bit key with 10 hexadecimal digits or a 128-bit WEP key with 26 hexadecimal digits. This will prevent other users from connecting to your wireless network. It will also protect your wireless transmissions/communications from being accessed or received by other users. 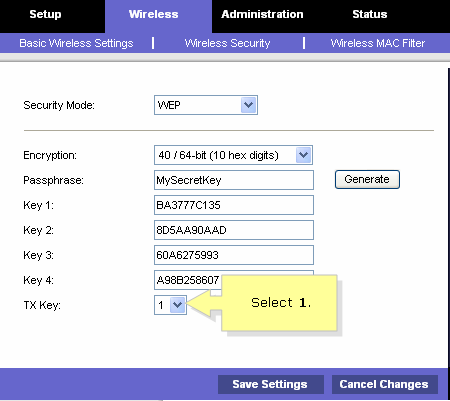 To setup 64- bit WEP Wireless Security on your Linksys Access Point follow the steps below. NOTE: If you are using a Mac computer to access the access point’s web-based setup page, click here. 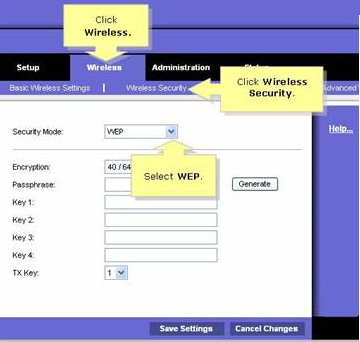 On the web-based setup page, click the Wireless then click the Wireless Security sub-tab. 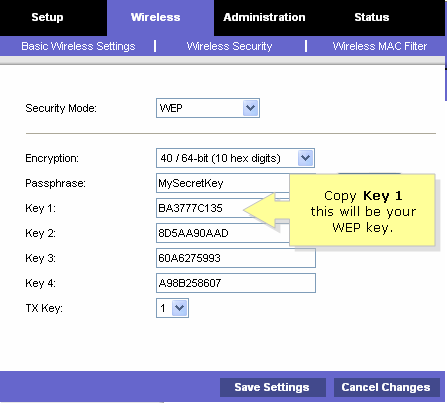 Click the drop-down arrow for Security Mode and select WEP. Click the drop-down arrow for Encryption and select 40/64-bit. 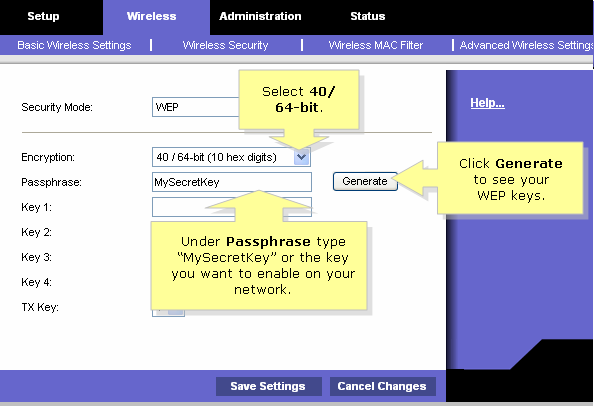 In the Passphrase field enter a wireless network password of your choice, then click the Generate button. NOTE: In this example “MySecretKey” is used. On the TX Key and select any number to determine which key you’ll be using. In this example, we selected 1. Take note of the string of characters on Key 1 since this will be your network key. NOTE: Keep your network key confidential.